A $0 recipe? Could it be true? Indeed it can, if you have a pantry stocked with the bare-bone basics. If you, like me, secretly love Chevy’s for the “El Machino” tortillas, make these even fresher, tastier ones and serve them simply with fresh butter or with tacos, fajitas, or alongside soup. In a bowl, stand-up mixer, or food processor, mix together flour, baking powder and salt. Slowly stream in olive oil and mix (use a fork if mixing in a bowl--run machine if using a stand-up mixer or food processor). Slowly stream in warm water, continuing to mix, until a very sticky dough forms. Knead, either by hand on a floured surface or in machine, until dough is very smooth and elastic (4-5 minutes by hand, 1-2 minutes using a machine). Transfer kneaded dough to a lightly oiled bowl. Cover with a clean kitchen towel and allow to rest for 20 minutes. Once dough has rested, transfer to a lightly floured surface and use a sharp knife to cut into 12 pieces. Shape each piece into a round ball. Allow to rest on floured surface for about 5 minutes. Use a floured rolling pin to roll each ball into a 6-7" circle (don't worry if it's not perfectly round--misshapen tortillas have character). Heat 2 large frying pans (to expedite total cooking time) over medium-high heat (don't add any oil). Cook the tortillas, a few at a time in the skillets, for 30-60 seconds on each side. They should have a few brown spots, but not too many. Make sure they are soft as opposed to crisp. Oh my goodness, these are fantastic! 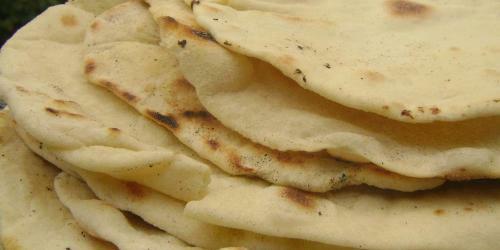 I ended up making 17 tortillas from this recipe, as I made them pretty thin. I made a crock pot of taco beans, some salsa fresca and we’ll pair it all with salad and fresh mozzarella. Lordy bigordy, this is good stuff, thank you! Can you make these with whole wheat flour? Good read. I find out something totally new and difficult on websites I stumbleupon each day. It will always be interesting to learn information from their editors and use a little from other online sites. Nice post. I learn something new and difficult on sites I stumbleupon daily. It will always be useful to study content from their author`s and use a little of their websites. Good read. I find out something totally new and challenging on articles I stumbleupon day-to-day. It’s always intriguing to read simple things material from the other authors and use a little from their sites. Good post. I learn something totally new and difficult on websites I stumbleupon daily. It will always be fascinating you just read content material from other freelance writers and use a little from their web-sites. Nice post. I learn something totally new and difficult on websites I stumbleupon every day. It will always be intriguing to learn material from the other freelance writers and use a little something from other internet sites. Nice post. I learn something new and challenging on webpages I stumbleupon day to day. It’s always interesting to learn articles from all other writers and use a little something of their online websites. Nice post. I find out something new and difficult on articles I stumbleupon every day. It will always be useful to read information from the other internet writers and use something from other sites. Good read. I find out something totally new and difficult on personal blogs I stumbleupon every day. It will always be interesting to learn written content from the author`s and practice something from other web-sites. Nice post. I learn something totally new and challenging on websites I stumbleupon regular. It will always be fascinating to read through written content from the internet writers and practice a little something of their internet sites. Good post. I learn something new and difficult on websites I stumbleupon regular. It’s always interesting to read articles from their editors and practice a little of their web-sites. Good read. I learn something totally new and challenging on articles I stumbleupon every day. It’s always fascinating to read through information posted by freelance writers and practice something from their sites. Good post. I learn something totally new and challenging on sites I stumbleupon everyday. It’s always useful to study content from their freelance writers and use a little something from their online sites. Nice post. I learn something totally new and challenging on blogs I stumbleupon each day. It’s always helpful to read through material posted by freelance writers and use something from other sites. Good post. I learn something new and difficult on sites I stumbleupon day to day. It’s always useful to read simple things written content from other writers and use a little something from other sites. This is a great and simple recipe.